﻿ 幕末霊異伝 MI・BU・RO (Bakumatsu Ryoiden MI BU RO) - J-RPG Blog! I discovered this new game on my daily haunt, Playspace Hiroshima. I found subsequent links via Google to Amazon.jp and Fukkan. Fukkan has a big description and some sample art, which I've inlined below (edit: note, I have hyperlinked to a super large version of the third image instead of inlining it). Fukkan states that it is a sequel to the 2005 game, 戦国霊異伝 , which I also know nothing about. Can anyone help translate and give me an idea what the game is about (other than something about the Shogunate and some crazy looking samurai going to war)? I'm betting it focuses on killer duels between samurai and ronin. I saw something about killer points and a wolf gauge? It kind of looks like a Rurouni Kenshin TRPG. The introduction of a new title to open up the eyes of the fans. This game isn’t simple the next instalment of the “Tale of Wonders of the Warring States” (戦国霊異伝), it’s rather a whole new game, fulfilling the call of the deeply rooted fans for a new work of the famous/excellent “Tale of Wonders of the Warring States”. Unfortunately the original producer Kirameki isn’t anymore. Therefore, based on the idea of producing Kirameki’s Bakumatsu-Edition [bakumatsu = the final period of the last shogunat], the office of TEAS designed and realized a construction of a new setting and system, easier to play, completing an even more captivating product. 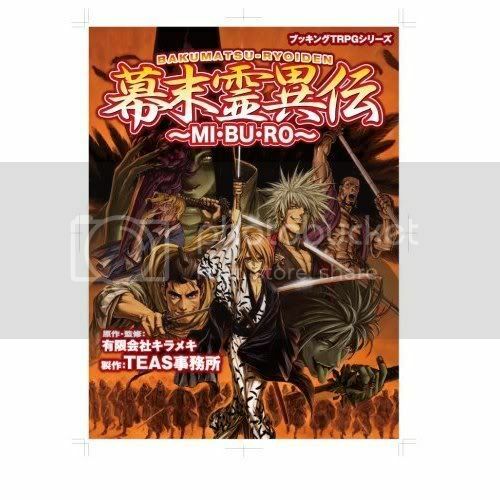 The battle of humans and monster/ghosts [yôkai] continues in a Japan, shaken by the turmoil of the bakumatsu period ---. * a revolutionary resolution system: Dice-rolls well reflecting swordfights with its deadliness [hard to translate]. * Implementation of party-shared “Fate”-points, allowing to escape death: managed by the GM, basically so that the they are kept hidden from the players, allowing the player to enjoy thrilling fights by having both heroism and a chance of survival. * Battle system: not the normal flow of hitting and evading, but the outcome decided by the clashing and crumbling of stances, reflecting the realistic swordplay. The ability to reflect battles that capture life in the middle of battles stages where death is more than just a possibility. * The many school-specific special techniques (“secret techniques”), and techniques that supplement these, produce adventurous battles in the bakumatsu period that exceed the historical facts. "Evolution(ized) Resoltuion System: Bladework story looks like, "Spaa!" (*sound of quick cutting*) through good cutting taste dice roll realization." It's also the reason why computer translation between E-J and particularly J-E will be perfected at around roughly the same time that we've developed warp drive and have colonized Saturn. Posted By: Diamond Sutra It's also the reason why computer translation between E-J and particularly J-E will be perfected at around roughly the same time that we've developed warp drive and have colonized Saturn. Warp Drive will come way before. BTW, I saw this game in a fwe of the Yellow Submarines that I visited. I ended up passing on it: The price point was too high, I ran into that "wall of text" effect with little layout to break it up. It honestly, seems like a straight reprinting of a game created in the early/mid 90s. Which is cool as an artifact, but a lot of unique, nifty designs and design elements have come out since. Looking through the game, it just seemed kinda standard. I guess the real magic behind the game is all caught in the sword school rules and dueling mechanics. The rest just felt kinda like an Everygame. Again, though, this was just at a glance.